I attached Mosley around my waist for our early morning walk, but my not-so-baby-anymore puppy recently had a growth spurt and I under-estimated just how strong he’d gotten. An arctic breed, my perpetually smiling samoyed thinks he’s dog-sledding whenever he’s attached to a leash – one of his favourite hobbies is to pull things and people, as I unfortunately learned. As he burst out the door and down the front steps, I grabbed the door frame with my left hand to steady myself at the same time my right hand was already preparing to swing the door shut behind us. The door slammed hard on my fingers in the jam. I yelped like a wounded animal and tugged Mosley with all my strength back into the house. I looked down at my hand – a large chunk of skin on my middle finger had been peeled back and it was starting to bleed. I screamed. My boyfriend came running down the stairs in a wild panic. He took one look at the blood running down my hand dripping onto the kitchen floor and let out a sigh of relief. He lead me over to the sink. I could feel my heart beating in my finger tips. I’m going to be sick. Instead of putting my finger over the sink like my boyfriend indicated me to, I dipped my head down just in case I threw up. No, I’m going to faint, I thought. I let my body slump to the floor, keeping my bloody hand fully elevated above my head. Mosley, who was still attached to my waist couldn’t quite figure out what was wrong with me or why I was groaning, so he kept making circles around me and licking at my face, until my boyfriend let him free from the leash. “It was all terribly melodramatic,” I admitted to my gramma a couple weeks later, when I was back in Saskatchewan and we were out for brunch. “But what on earth were you afraid of?” My gramma asked when I’d finished my story. “I clearly can’t handle the sight of blood,” I said. “But why?” she was incredulous. “I guess because I associate blood with death,” I said, but that doesn’t make any sense. I wasn’t going to die from getting my finger caught in a door jam. I knew that as I looked down at my scarred finger, but I also knew I was really afraid of death. I looked at my gramma who was telling me how to get over this bewildering phobia of non-death-related blood, but what I really heard her saying was to be stronger than I am. 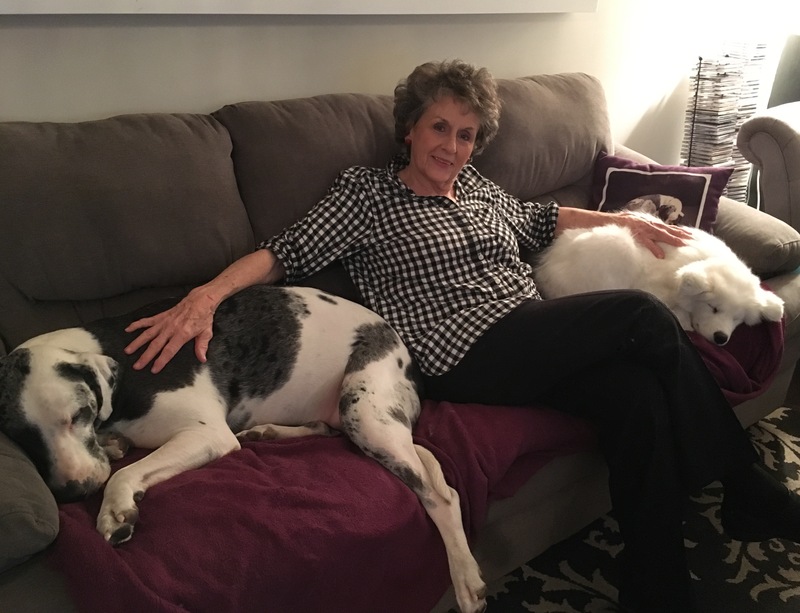 My gramma is a dog whisperer. 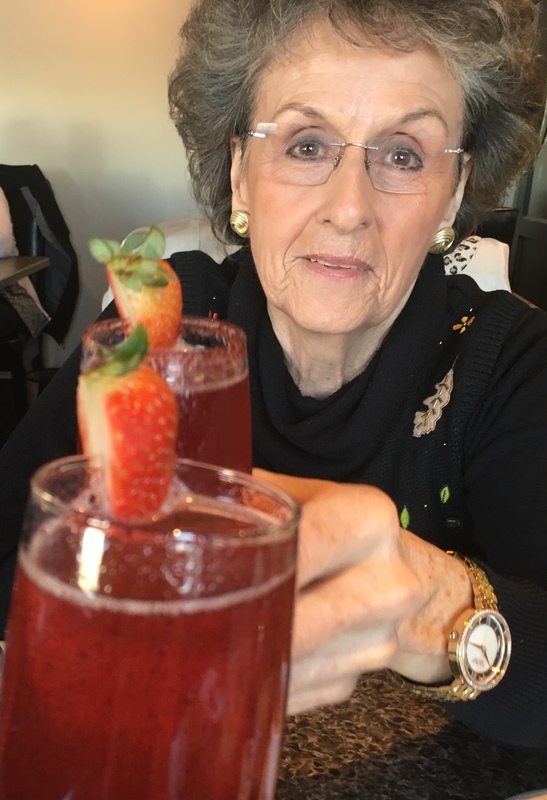 There are a lot of things I could tell you about my gramma, but this one thing will give you a pretty clear idea of who she is and how she’s always helped me growing up. During those four days I was in Saskatchewan in October with Mo, he was too excited to slow down. He refused to sleep. He wanted to play all the time – inside, outside; he wanted to dig holes and roll around in my parents garage. When I got back from brunch with my gramma that day, I found a tuckered out Flayla and a brown Mosley. In fact, he was brown with large, black spots all over him. He’d apparently traded in his snow-white fur for the wildest adventure of his life. “It was epic, Maman,” his wide-eyed grin told me. I was beside myself. I shot a glance at my mom who’d been looking after the dogs all day. She just shrugged. That night, we took Flayla and Mosley back to Sam’s and my gramma offered to give Mo a bath. I cringed. Bathing this puppy is a two-person job – one to apply the soap and the other to hold him down and prevent him from tearing at your clothes and scratching at your face and otherwise try to claw his way out of the tub. As far as he’s concerned, the bath tub is an evil, devil-possessed shrine to the cleanliness gods that want nothing more than to take away his puppyhood and strip him of all liberty to get into all the kinds of smelly trouble the world has to offer. He believes these clean-freak deities mean to melt him as soon as the water turns on. 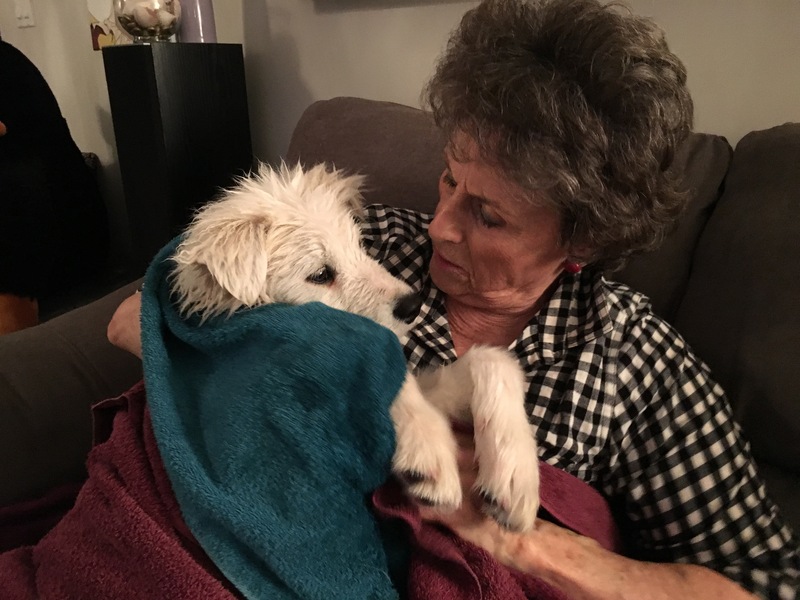 Gramma and Mosley after bath time. He’s half right. He literally shrinks to about half his size when his fur is wet, requiring us to dry him with a cold-air blow drier he hates equally as much as the bath. When we do this at home, we usually wear bathing suits because we know we’re going to get soaked in the process. My gramma was still dressed in her good Sunday clothes, but she didn’t seem concerned. She picked up my filthy dog and placed him in the bath tub, then in a soothing voice she coaxed him to come towards her and very carefully she began to run the water lightly. She continued to speak to him in that soothing voice until she got the temperature just right and then she very gently used the telephone shower head to massage the black spots out of his fur. He didn’t move a muscle. My gramma speaks dog. When the bath was over – and it was long, she bundled him up in two towels and carried him out to the living room. She sat on the couch and held him in her lap. For the next 45 minutes, she dried him by hand. Mosley nestled into her lap and let her do it. Finally, he jumped down from the couch and made his way to the door where he stopped and waited. I let him out and when we came back up, he jumped right up onto the couch beside my gramma again and fell asleep. Flayla jumped up on the other side of her and nestled into sleep. There are things you can’t learn from Google because they come only from the mothers and fathers and grandparents in your life – things like how to whisper to dogs, the best recipe to bring to a dinner party, how to survive a break-up, and how to deal with conflict with other people. And then they teach you that you’re capable of doing all those things. You are capable of being a good mom, of being happy, of being at peace, of being stronger than you are.